Precision is a description of random errors, a measure of statistical variability. More commonly, it is a description of systematic errors, a measure of statistical bias; as these cause a difference between a result and a "true" value, ISO calls this trueness. Alternatively, ISO defines accuracy as describing a combination of both types of observational error above (random and systematic), so high accuracy requires both high precision and high trueness. In simplest terms, given a set of data points from repeated measurements of the same quantity, the set can be said to be precise if the values are close to each other, while the set can be said to be accurate if their average is close to the true value of the quantity being measured. In the first, more common definition above, the two concepts are independent of each other, so a particular set of data can be said to be either accurate, or precise, or both, or neither. In the fields of science and engineering, the accuracy of a measurement system is the degree of closeness of measurements of a quantity to that quantity's true value. The precision of a measurement system, related to reproducibility and repeatability, is the degree to which repeated measurements under unchanged conditions show the same results. Although the two words precision and accuracy can be synonymous in colloquial use, they are deliberately contrasted in the context of the scientific method. The field of statistics, where the interpretation of measurements plays a central role, prefers to use the terms bias and variability instead of accuracy and precision: bias is the amount of inaccuracy and variability is the amount of imprecision. In numerical analysis, accuracy is also the nearness of a calculation to the true value; while precision is the resolution of the representation, typically defined by the number of decimal or binary digits. 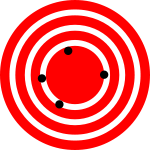 In military terms, accuracy refers primarily to the accuracy of fire (or "justesse de tir"), the precision of fire expressed by the closeness of a grouping of shots at and around the centre of the target. In industrial instrumentation, accuracy is the measurement tolerance, or transmission of the instrument and defines the limits of the errors made when the instrument is used in normal operating conditions. Ideally a measurement device is both accurate and precise, with measurements all close to and tightly clustered around the true value. The accuracy and precision of a measurement process is usually established by repeatedly measuring some traceable reference standard. Such standards are defined in the International System of Units (abbreviated SI from French: Système international d'unités) and maintained by national standards organizations such as the National Institute of Standards and Technology in the United States. This also applies when measurements are repeated and averaged. In that case, the term standard error is properly applied: the precision of the average is equal to the known standard deviation of the process divided by the square root of the number of measurements averaged. Further, the central limit theorem shows that the probability distribution of the averaged measurements will be closer to a normal distribution than that of individual measurements. the difference between the mean of the measurements and the reference value, the bias. Establishing and correcting for bias is necessary for calibration. the combined effect of that and precision. A common convention in science and engineering is to express accuracy and/or precision implicitly by means of significant figures. Here, when not explicitly stated, the margin of error is understood to be one-half the value of the last significant place. For instance, a recording of 843.6 m, or 843.0 m, or 800.0 m would imply a margin of 0.05 m (the last significant place is the tenths place), while a recording of 8436 m would imply a margin of error of 0.5 m (the last significant digits are the units). A reading of 8,000 m, with trailing zeroes and no decimal point, is ambiguous; the trailing zeroes may or may not be intended as significant figures. To avoid this ambiguity, the number could be represented in scientific notation: 8.0 × 103 m indicates that the first zero is significant (hence a margin of 50 m) while 8.000 × 103 m indicates that all three zeroes are significant, giving a margin of 0.5 m. Similarly, it is possible to use a multiple of the basic measurement unit: 8.0 km is equivalent to 8.0 × 103 m. In fact, it indicates a margin of 0.05 km (50 m). However, reliance on this convention can lead to false precision errors when accepting data from sources that do not obey it. For example, a source reporting a number like 153,753 with precision +/- 5,000 looks like it has precision +/- 0.5. Under the convention it would have been rounded to 154,000.
reproducibility — the variation arising using the same measurement process among different instruments and operators, and over longer time periods. A shift in the meaning of these terms appeared with the publication of the ISO 5725 series of standards in 1994, which is also reflected in the 2008 issue of the "BIPM International Vocabulary of Metrology" (VIM), items 2.13 and 2.14. According to ISO 5725-1, the general term "accuracy" is used to describe the closeness of a measurement to the true value. When the term is applied to sets of measurements of the same measurand, it involves a component of random error and a component of systematic error. In this case trueness is the closeness of the mean of a set of measurement results to the actual (true) value and precision is the closeness of agreement among a set of results. ISO 5725-1 and VIM also avoid the use of the term "bias", previously specified in BS 5497-1, because it has different connotations outside the fields of science and engineering, as in medicine and law. In psychometrics and psychophysics, the term accuracy is interchangeably used with validity and constant error. Precision is a synonym for reliability and variable error. The validity of a measurement instrument or psychological test is established through experiment or correlation with behavior. Reliability is established with a variety of statistical techniques, classically through an internal consistency test like Cronbach's alpha to ensure sets of related questions have related responses, and then comparison of those related question between reference and target population. In logic simulation, a common mistake in evaluation of accurate models is to compare a logic simulation model to a transistor circuit simulation model. This is a comparison of differences in precision, not accuracy. Precision is measured with respect to detail and accuracy is measured with respect to reality. Information retrieval systems, such as databases and web search engines, are evaluated by many different metrics, some of which are derived from the confusion matrix, which divides results into true positives (documents correctly retrieved), true negatives (documents correctly not retrieved), false positives (documents incorrectly retrieved), and false negatives (documents incorrectly not retrieved). Commonly used metrics include the notions of precision and recall. In this context, precision is defined as the fraction of retrieved documents which are relevant to the query (true positives divided by true+false positives), using a set of ground truth relevant results selected by humans. Recall is defined as the fraction of relevant documents retrieved compared to the total number of relevant documents (true positives divided by true positives+false negatives). Less commonly, the metric of accuracy is used, is defined as the total number of correct classifications (true positives plus true negatives) divided by the total number of documents. None of these metrics take into account the ranking of results. Ranking is very important for web search engines because readers seldom go past the first page of results, and there are too many documents on the web to manually classify all of them as to whether they should be included or excluded from a given search. Adding a cutoff at a particular number of results takes ranking into account to some degree. The measure precision at k, for example, is a measure of precision looking only at the top ten (k=10) search results. More sophisticated metrics, such as discounted cumulative gain, take into account each individual ranking, and are more commonly used where this is important. ^ Taylor, John Robert (1999). An Introduction to Error Analysis: The Study of Uncertainties in Physical Measurements. University Science Books. pp. 128–129. ISBN 0-935702-75-X. ^ Metz, CE (October 1978). "Basic principles of ROC analysis" (PDF). Semin Nucl Med. 8 (4): 283–98. PMID 112681. ^ Powers, David M. W (2015). "What the F-measure doesn't measure". arXiv:1503.06410 [cs.IR]. ^ David M W Powers. "The Problem with Kappa" (PDF). Anthology.aclweb.org. Retrieved 11 December 2017. ^ Acken, John M. (1997). "none". Encyclopedia of Computer Science and Technology. 36: 281–306. ^ Glasser, Mark; Mathews, Rob; Acken, John M. (June 1990). "1990 Workshop on Logic-Level Modelling for ASICS". SIGDA Newsletter. 20 (1). 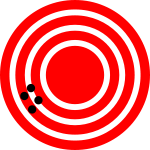 Look up accuracy, or precision in Wiktionary, the free dictionary. Wikimedia Commons has media related to Accuracy and precision.